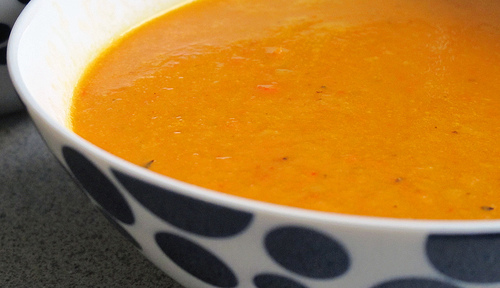 This is a recipe from a few years back, but it makes such a tasty soup, and it is amazing chilled, so I thought on this very hot day, it sounded perfect. The key is to make sure the carrots are thoroughly cooked; otherwise they won’t purée properly and to only add the lime juice at the end to maintain the full flavor. 1 Tbsp Curry Paste or Curry Powder. ¾ cup Heavy Cream or So Delicious Creamer or similar. Heat olive oil and butter in a heavy saucepan, and then add the onions and shallots and sauté until translucent. Add the carrots and cook for a further 5 mintues. Now add the curry paste, salt, cayenne pepper and sauté for one minute. Add the broth and simmer for 30 minutes or until the carrots are cooked through. Puree the mixture using a hand blender in the saucepan or transfer to a food processor and purée in batches. Then add all back to saucepan and add in heavy cream, bring to a gentle simmer, add lime juice and serve. You may garnish with a bit of chopped chives if desired. If you want to serve it chilled, cool it down quickly by putting the soup into a large bowl and sitting it in an ice bath. Then cool completely in the refrigerator and serve.